How do I know the reservation is completed? You will receive a confirmation by email. If you do not receive the email confirmation, please check your junk mailbox. Why can't I make a reservation to certain types of rooms? In this situation, please check the amount of minimum of nights to stay. If there is no minimum stay, it means the room is not available. Why do I have to provide my Credit Card information when I book the room? Will I be charged the room fee? Your Credit Card information is required to guarantee your booking. No charge will be done in this one. Payment will be due at the time of check-in. You can pay by Cash or Credit Card. Can I make a phone call or send FB message to book a room? Phone call booking only accept today’s or tomorrow’s reservation. We don’t accept using FB message to make a reservation, but you can use it for checking availability. We have 7 people, can we all stay in the same 8 people room? If you book together we will arrange a room for all of you. If each of you book separately, please specify in notes and let us know. If you don’t want other people staying in the same room, please book 8 person in a 8 people room. Can I reserve all the beds as whole hostel being private? We can accommodate about 150 people. If you need to reserve all the beds, please send us an email first to check availability. I would like to cancel my booking, can I get my money back? 1. Cancellation made 3 days before your arrival day, 100% room fee could be refunded. 2. Cancellation made 1~2 days before your arrival day, 50% room fee could be refunded. 3. Cancellation made on arrival day or directly No Show, no fee will be refunded. 4. No refund after check-in. Attention: If your staying dates is including any of Dec. 29th, Dec. 30th, Dec. 31st, and Jan. 1st, "full amount" of room fee will be charged in advance. Any cancallation happens, room fee shall not be refunded but you can use it for your next booking. Is it possible to check in before 3:00 PM? You can check in and leave your luggage in the luggage room, but you can't go into the room before 3:00 PM. What should I do if I arrive after 10:30 PM(late check-in)? You'll find your room card at the front desk under the light and next to the sign. 1. Find the card with your name (a paper with your name, room floor and number. 2. Go to the room and find the bed with your name tag. 3. Come to the reception the following morning to finalize your check-in. Can I request a lower bunk when I book the room? Customers whoever comes first have the right to choose bed first. If there’s no lower bunk for you in your original room, consider aged people or physical disability you still urgently need one, we can change your room where lower bunk is available. Can I access the luggage room out of the reception's opening hours? Yes, the luggage room is open 24 hs, you can leave your luggage at anytime before check-in or after check-out. Luggage room is free access, you can put your luggage yourself. Once upon check in you can have complimentary free breakfast during 8:30am-10:30am. I will check out really early, can I take out my breakfast? If I don’t want to have breakfast, could the room fee be cheaper? Sorry, our staff finish preparing breakfast at 8:30am. It is only available during 8:30 - 10 : 30am. It can’t be deducted from the room fee as well. I left my things in Homey, can you send it to my address? If we found your things, we can send it to your intend address. The fee includes shipping fee and additional NTD100 ~ 300 service fee. We will ask you to provide credit card number to charge this fee. Do you have discount on monthly package? We only offer monthly package in dormitory rooms. The fee for 30 days is NTD 12,000, and it shall be paid upon arrival. We don’t offer installment plan and the fee can’t be refunded for any reason. Before you make a reservation please send us a email to ask availability. All of our rooms use public toilets and shower rooms. But rest assured, we clean them everyday so it’s very clean. We also provide shower gel and shampoo for free. There is more, we offer washlet and ethyl alcohol in the toilets. Is there hair dryer provided in the room? We provide hair dryer in our public shower rooms. It’s professional salon class hair dryer. You can have your hair dried very quickly. Is the hot water provided anytime? Yes, Homey shower rooms offer hot water 24 hours. Whenever you arrive you can have a comfortable shower! Is there a washing machine ? We have a washing machine and dryer machine in the laundry room. There are also hangers provided and free washing powder. Is there a bed curtain in dormitory room? We have bed curtain for every single bed, so you can keep privacy in your bed. What equipment does the kitchen provide? We offer refrigerator, oven (big and small), water dispenser, microwave, kitchenware and seasoning. We offer free and unlimited wifi for 24 hours! We also have pocket wifi for rental. Is there a place to put my bicycle in the room ? You can put your bicycle in our public area. You can directly bring your bicycle to 7F and we will show you where to put it. Homey is at 7 floor, is there an elevator? This building has two elevator, you can use it to carry your luggage, don’t worry! Does everyone have a locker? How big is it ? Do I need to bring a lock? Every bed is equipped with a combination locker, you don’t need to prepare your oｗn lock. Room type above 6 people has larger locker, the size is about 50cmx42cmx85cm, and 4 people room is about 50cmx42cmx42cm. Which metro station is closer to Homey? Homey is about 7 min on foot to Taipei Main Station or ZhongShan station. 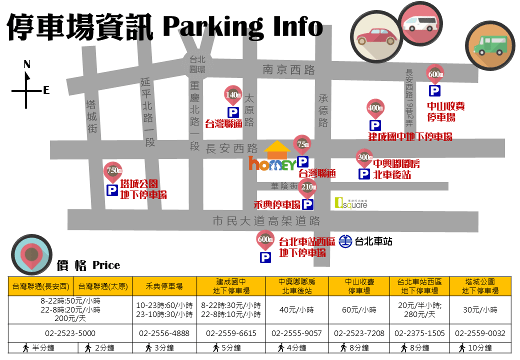 How can I go to Homey Hostel from Taipei Main Station? Exit from Gate North 3, then head to Chengde Rd., turn left when you are in KFC(Mc Donald’s), keep walking after 2 blocks, you will see Homey Hostel sign and arrive no.180 in a building, take elevator to the 7th floor. How long does it take to walk to Ningxia night market? It takes 7 to 10 minutes. Is the toiletries included in the room fee (Towels/flip flop/toothbrush, etc)? Toiletries is free of charge when you book Twin or Single room. When you book beds in dormitories, you can buy/rent toiletries at the reception. Is there entry access control(curfew)? The lobby is open for 24 hours, as well as the first floor’s security control. Is there an invoice for the room fee ? Payment by cash or credit card will have an invoice. Payments already completed from other sources of booking channel do not apply to this service. If needed, please contact the channel where you make the reservation. I forgot my things in Homey one month ago, can you still find it? Sorry, we only keep lost and found for a week. If you want to check again please send us an email. Is there any job opportunities?